President Kennedy’s vision for American arts is realized, in part, in the United States Capitol. It is a rare building that not only houses art, but is itself a work of art. The stately Statue of Freedom standing atop the elegant, gleaming dome is recognizable to people all around the world. Its painting Declaration of Independence by John Trumbull illustrates history books and can even be found on the two-dollar bill. Just as each state may send two Senators to Washington, each may also send two statues to the National Statuary Hall Collection. (The statues, however, have far better reelection rates and far less rancorous campaigns. Some, however, actually have been recalled.) The whole edifice is ornamented and adorned and neither the original builders nor today’s caretakers have overlooked the slightest details. Nothing has been neglected—not even the Cannon Tunnel, whose purpose is simply to allow Members of Congress, their staffs, and visitors to pass quickly back and forth between the Capitol and the Cannon House Office Building. Each year, the House of Representatives decorates the tunnel with the winning artworks from the Congressional Art Competition. Begun in 1982, the competition provides an opportunity for Members of Congress to encourage and recognize the artistic talents of their young constituents. Each Member of the House may sponsor a competition for high school students in his or her district. The winning artwork from each district will be displayed in the tunnel until the end of May 2012. The 2011 Congressional Art Competition was the largest ever, with 405 Members of Congress sponsoring artworks. Additionally, with this year’s entrants, an estimated 690,000 students have participated since the competition began. Leadership of this project is bipartisan and rotates annually, and Congresswoman Donna F. Edwards (D-MD) and Congressman Leonard Lance (R-NJ) served as co-chairs this year. Pride by Melanie Whiting of Colorado’s 3rd Congressional District. One of the major responsibilities of the co-chairs is to greet the winners when they converge on Washington to view the exhibit. It is a tremendous honor for the students to see their artworks being displayed in the Capitol. When they view it in that context, they can see that many of their pieces of art share much in common with the paintings throughout the Capitol. Patriotism is a common motif, and many of the artworks celebrate the nation as a whole. The American flag is prominently displayed in a number of the pieces that are displayed each year. Likewise, members of the armed forces are popular subjects for the artwork. Finally, viewers of the exhibition are treated to a lesson in American history. The 2011 Congressional Art Competition winners include, for example, a painting of George Washington and other patriots engaged in the battle for American independence. On a more personal level, one drawing depicts the artist’s grandmother greeting her brother when he returns from World War II. Still others celebrate the heritage of African-Americans and the various Native American groups that have played important roles in our country’s history. 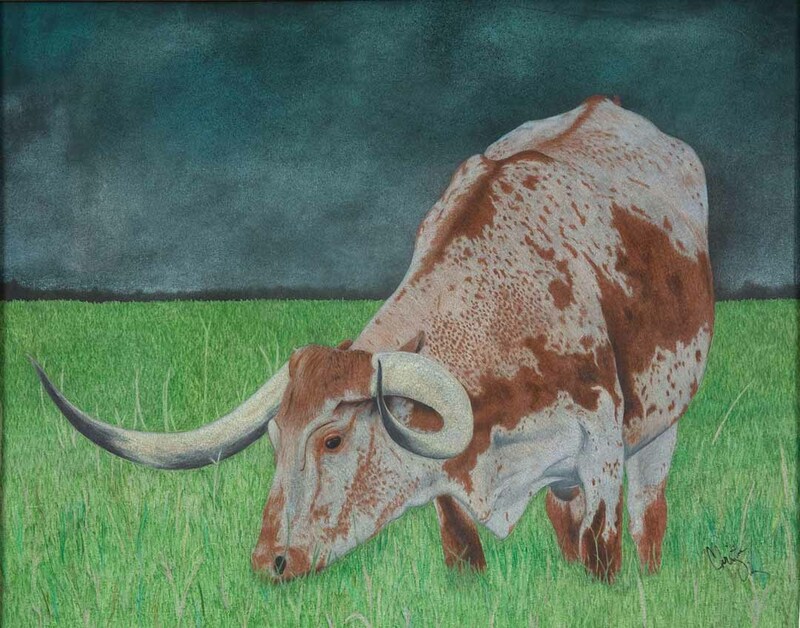 as Grazing by Christian Diaz of Texas’ 14th Congressional District. 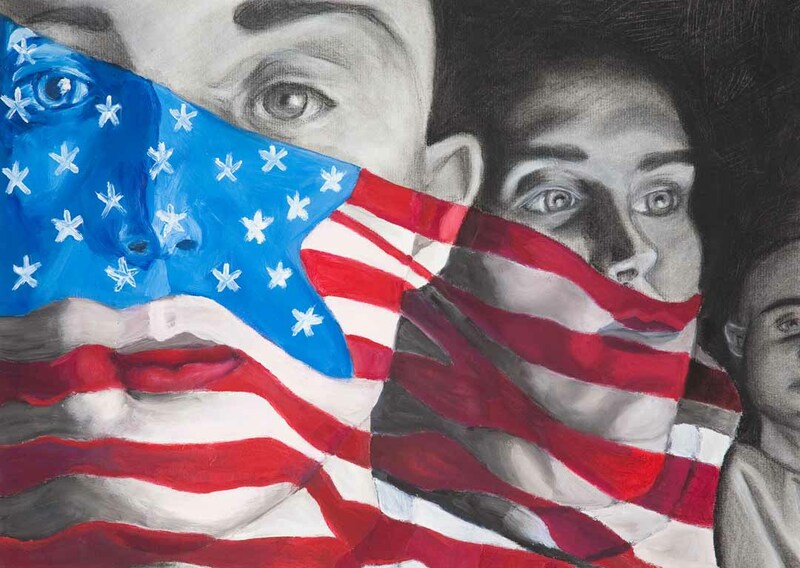 Although national unity is a prominent theme in the artwork, the Congressional Art Competition reminds viewers that the country is a union of distinct states. In that respect, it is similar to the National Statuary Hall Collection, located only a few floors above. The artwork sent to Washington demonstrates the pride the young artists have for their states and communities. For instance, one 2011 winner, “Since 1912”, celebrates the admission of New Mexico to the Union. In others we see scenes of what local life is like. A student from Texas might depict cattle on a ranch, whereas one from Chicago might submit a cityscape. In viewing the whole exhibit, either in person or via the web gallery, one sees the manifestation of one of our country’s most cherished mottoes, “E pluribus, unum”—“Out of many, one”. The winners and their guests were invited to the Capitol for a reception in their honor on Wednesday, June 22. Due to exceptionally high participation this year, two separate events were held, and each winner was invited to one based on the location of their district. Students attended a reception in the Capitol Visitor Center, followed by a program in the Capitol Visitor Center Auditorium. Congresswoman Edwards and Congressman Lance both addressed the winners, congratulating them on their achievements and encouraging their artistic ambitions. Then, at each session, a professional artist spoke at the invitation of one of the co-chairs. Greg Mort represented Maryland in the morning, and Mansa K. Mussa from New Jersey spoke in the afternoon. Both men discussed their experiences producing art professionally and showed the audience some examples of their work. (Mr. Mussa even modeled a hat and belt he had made that morning!) Both artists tapped into the enthusiasm the students had for art and were able to channel this energy to lively Q-and-A periods. The conclusion—and highlight—of the program was the slideshow featuring the students’ artworks. Additionally, the students had the opportunity to see the exhibit in the Cannon Tunnel and meet with their Members of Congress. When the students visited Congress in June, it was the culmination of a four-month process. Offices began organizing their own competitions in late February. There are a number of rules concerning what may be submitted and how government resources may be used, but beyond these restrictions, offices are independent in organizing the Congressional Art Competition—and they vary widely. Although the Congressional Art Competition benefits the Capitol, it is largely supported by contributions, not public funds. The Congressional Institute underwrites the reception for the winners in Washington each year and also provides crucial logistical support to the Congressional offices that participate in the competition. Additionally, Southwest Airlines donates vouchers so that students and guests may attend the reception at the Capitol. The Savannah College of Art and Design offers a scholarship to each winner who enrolls there, and other art schools provide similar grants so students may continue to refine their skills. Local businesses provide frames for the winners or other prizes to recognize the students’ achievements. Those who support the Congressional Art Competition winners, along with the Members of Congress who participate in the program, no doubt honor the students chosen each year. But it affects more than just them. American citizens taking tours of the Capitol often will stop to appreciate their home district’s contribution. Foreign visitors can see the varied and vibrant talent that our schools and communities foster. The Capitol becomes a place not just for argument, but also for art. With each new crop of artworks to decorate the Cannon Tunnel, the Congressional Art Competition serves to “ raise the standards of artistic accomplishment and…steadily enlarge cultural opportunities” for each American. For photos from the receptions, click here. Video clips of the morning and afternoon programs are available as well.